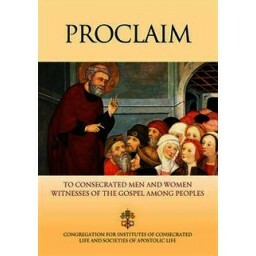 Fifty years after the Vatican Council’s Decree on the Renewal of Religious Life (Perfectae Caritatis, 1965), the Church reflects on the great force for evangelisation that lies with today’s consecrated men and women. Such witness - love for God and neighbour, love of the cross and the hope of future glory - speaks to the far corners of today’s world and is to be greatly valued. Proclaim continues the reflection which began in the Letters Rejoice, Keep Watch and Contemplate so that the insights of the Year of Consecrated Life may continue to bear fruit.